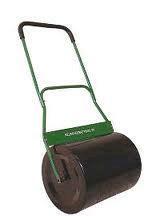 Plastic roller with handle for smoothing turf. With a full drum of water the unit weighs about 250 pounds. * Please call us with any questions you may hav about our roller lawn rentals in Wayzata MN and the Western suburbs of Minneapolis.